As a follow up to my previous post, now I’m bored. What I didn’t mention in my last post, after all the self-congratulations and pie eating had been done, was that most of the time was spent waiting. In offices, on a bus, for a phone call, or for test results to come back. I shouldn’t be complaining. I gave myself two months to accomplish everything on my list, and I think that I’m slightly ahead of schedule (even with the extras that got thrown in, like the hard drive saga). But the most annoying thing about being restless is when I know that I need to rely on others to help me accomplish something, and I also know that they are busy and I may not be their first priority. Me being respectful I will sit on my hands and keep my mouth shut, and watch “Howl’s Moving Castle” for the five hundredth time. Or I’ll make cookies again, much to the delight of my family, and the chagrin of my former coworkers. But I have never liked the waiting place. It is grey, and soft, and pliable, with no discerning borders. It is a place that echos with words like “eventually”, and “perhaps”, and “another time”. Clocks do not work in the Waiting Place, for this place is timeless and does not have a known end date. 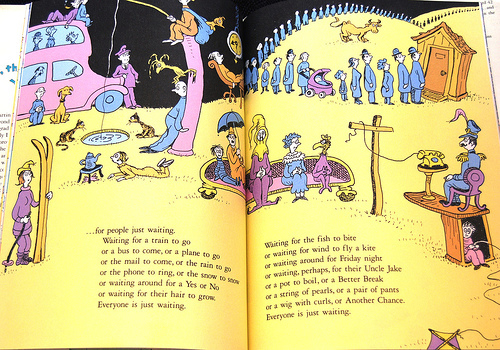 The Waiting Place; purgatory for those that are not quite bored, but not quite occupied. There are things that I do to bide my time, while I find myself here, in addition to the actual checklist. I bake, and cook, and clean, and read, and write. But as more and more items are crossed off my checklist, and I get closer and closer to finalizing some other things, I find myself reaching for the door to let me out of this place – even though I don’t currently have anything on the other side. Heck, I don’t even know where the door is. But, I have been in this place before, and we are old friends. I know that, sometime soon in the future, I will be granted leave from the Waiting Place. My ticket will be punched and I will be allowed through that elusive door to whatever waits on the other side. Probably a job. Definitely something that will keep me busy on a more routine schedule. Whatever it is, I do know that I will occasionally look back fondly at the time I spent in the Waiting Place, if only because at least I was able to enjoy my coffee without doing something else. It’s amazing how much stuff you can do when you find yourself not working. I think I deserve a pat on the back, and some chocolate-peanut butter pie. The other night, while the hubby and I were both relaxing after long days of work and restlessness, we were talking about my blog. I was trying to run ideas by him as far as how often to post, Tags and Categories, etc. – he works in Marketing, and while we both understand the importance of Social Media in things like this, he’s a few levels above me. And as amazing as that seems, it doesn’t interest me. For every Julie/Julia project there are hundreds, if not thousands, of blogs that don’t get any further than the poster’s most intimate circle of friends. In the early days of blogging, some of my high school friends used it as a (fairly boring) daily journal of what they ate that day. There was no hook, no interest in following something like that. But the blog has evolved into something more. It’s actually okay to post daily journals of what you eat now; this is more commonly referred to as Instagram. And while I would not do that because I prefer putting the food in my mouth, I do feel the need to get my many thoughts out on (digital) paper. But more than that, I don’t want to be the next Julia/Julia project. That’s been done already. And although it worked to everyone’s advantage, I don’t want to be known forever more as version 2.0 of Julie/Julia. Also, I couldn’t cook everything in “Mastering the Art of French Cooking” because I keep Kosher. Lobster is kind of a no-no. While I don’t expect to gain a huge following, I’m not going to lie and say that it wouldn’t be awesome. I would be extremely happy if my opinions were shared globally, but I’m also realistic. For now, I’m happy to stay in my little corner and hone my writing skills. But if, somewhere down the line, my blog does manage to get picked up by Paramount, I would really want Jennifer Lawrence to play me. We can make that happen, right? This blog has been three years in the making. When my now three-plus-year-old was born I transformed from a full-time paralegal to a stay-at-home-mom. It was something that I was fiercely determined to do, for myself and for my little nooshkin, for the first year of her life; the hubby was supportive from the get-go and did whatever he could to make sure that we could hang out all day. And so, after the grandparents had left and things had settled down, I was finally at home with my brand new, fresh out of a dirty diaper, baby girl. We had a routine, but I was always looking for something else to do. There are only so many times you can go to the same stores and not buy anything before A) the shop owners tell you not to come back, and B) you begin to get restless. There was a lot of nothing to do. And there was no-one else to do it with. I began blog-browsing. Favorites included How Sweet It Is, Smitten Kitchen, Eat the Damn Cake, Scary Mommy, and Surviving the World. (notice a theme here?) Bookmarks popped up by the dozen; when there were over 30 food-related ones I thought about starting a cooking blog. Except, that’s what everyone was (and still is) doing. I don’t really like doing what everyone else is doing. The idea of a blog still interested me, and I spoke about it often with the hubby, but nothing came of it except a gradual progression of my cooking skills. About a month after she entered daycare I was back in the workforce, this time as a customer service representative for an e-commerce company with three unique sites that sold Judaica items, customized jewelry, and engagement rings/wedding bands. It was fun; I had great coworkers, the work was interesting enough, and the hours worked well with my other full-time job of parenting. I was no longer restless. And then, after two years and three months, I decided to quit. While it wasn’t an easy decision, and one that I had agonized over for a few months, it was the right one. And here we are – four weeks later. I’m in the process of accomplishing things that I had pushed off for two years, and I find myself restless again. Not bored, but not fully occupied. Waiting for something to happen. So, buoyed by recent semi-success in posting an op-ed piece on another site, and the hubby’s support, I revisited the idea of my blog. I’m glad I waited to do this. Good things come to those who wait.